Nice all-inclusive hotel for this price. I chose Excellence brand because I have been to their Finest Playa Mujeres one in Cancun, and loved everything I had there. In general, Excellence Punta Cana does match with Finest Playa Mujeres (about 70% similar). Pro: good price, nice beach, some good dinner places, very nice garden, good bar selection, very nice tennis courts, and some very friendly staffs. Con: a bit far from the Airport, the beach normally has big waves (not good for swimming), 70% of the restaurants only open for dinner, one lunch restaurant (Oregano) is awful, many of the staffs gave me a feeling that they are very hungry for tips, daily shows give a cheap feeling (they might do better just have some local bands playing), WATCH OUT FOR YOUR WALLET and VALUABLES (this place doesn't have security cameras, and I lost $200 by the swimming pool on the first day, an expensive lesson learned). We had an ant problem in our room. Service is top notch. Always on top of your needs. Food was mediocre. I really enjoyed my time in this hotel. Everything was wonderful! We absolutely loved the attention to every detail. The best part was the fabulous staff. Lots of fun and very attentive. We felt like we had made a bunch of new friends. Facilities and rooms very clean. Great entertainment. Food very good as well although the Lobster House was disappointing. That's probably because we are from New England were we have the best lobster. We would recommend this resort and we will be back again. Everything was fantastic! Best food I’ve ever had on vacation! Very nice beach ... and clean! Great choice of restaurants. Lovely all inclusive, beautiful beach, good restaurants with large variety, wonderful service by staff. Staff was unfriendly and borderline rude, food was average at best. They would not allow swimming in ocean. Both rooms we had access to smelled like mildew. Nice hotel close to the beach. We loved the beach. Restaurant was very marginal if not disappointing at the Grill and Lobster House. One morning at breakfast at Magna we asked for coffee several times only to have it brought to us as we were leaving. Otherwise everything else was great and we are hoping the food issue was just a bad week. The staff was amazing. They were happy, helpful, and concerned about my every need. The food was delicious and the rooms were clean and spacious. I stayed in a Suite which overlooked the Excellence Club pool and had an ocean view. I will definitely visit again. The Magna restaurant staff was the best. Breakfast and Dinner were an everyday treat. Excellence Punta Cana Adults Only All Inclusive places you 8.5 mi (13.6 km) from Macao Beach. This 461-room, 5-star property has 4 outdoor pools along with a private beach and a full-service spa. Start your day off right with a free buffet breakfast offered each morning. This property is home to 11 onsite restaurants, perfect for a quick bite to eat. Savor a meal from the privacy of your room with 24-hour room service, or get a pick-me-up at the coffee shop/café. An LED TV comes with cable channels and a DVD player, and guests can stay connected with free WiFi. Beds sport premium bedding and pillow menus, and the bathroom offers a jetted tub, a rainfall showerhead, a hair dryer, and designer toiletries. Other standard amenities include a furnished balcony or patio, an iPod dock, and a sitting area. 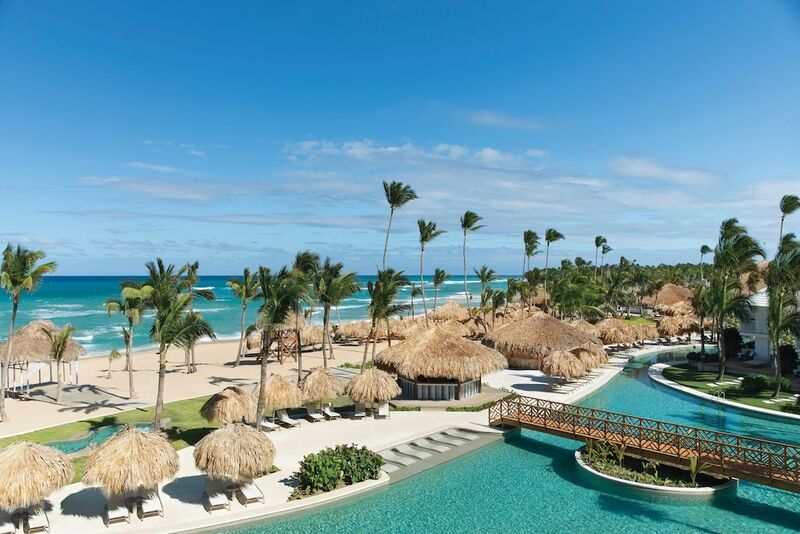 Excellence Punta Cana Adults Only All Inclusive features a private beach, a full-service spa, and 4 outdoor pools. For transportation, you can make use of an airport shuttle (available 24 hours) for USD 140 per person roundtrip, as well as limo/town car service. A multilingual staff is on hand to assist with luggage storage, concierge services, and dry cleaning/laundry. Other amenities at this adults-only property include a fitness center, 2 spa tubs, and a sauna. Excellence Punta Cana Adults Only All Inclusive features a private beach and outdoor tennis courts. The property has 4 outdoor swimming pools and 2 spa tubs. A sauna and a fitness center are other recreation options. The preferred airport is Punta Cana (PUJ-Punta Cana Intl. ): 44-min drive, 28.3 mi/45.5 km. For convenient arrivals and departures, you can take advantage of the airport shuttle (available 24 hours), which is offered for a fee. This package is complimentary when booking an Excellence Club Junior Suite Ocean View category or higher, for a minimum of 7 nights, or with a bridal party of minimum 5 rooms of any category for 7 nights. This package cannot be combined with the Excellence Honeymoon complimentary package. Guest list should be provided at the time of redemption. Package suitable for up to 10 guests lodged at the hotel. Fees for all services will be charged for each additional guest. Offer subject to availability. Offer is not valid with groups/conventions and may not be combined with other promotional offers. Other restrictions and blackout dates may apply.